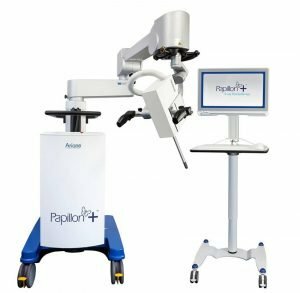 The Papillon+™ system consists of a mobile x-ray generator, work station, application related accessories and quality assurance devices. The appropriate application adaptor and associated software must be installed to facilitate use for each treatment application. 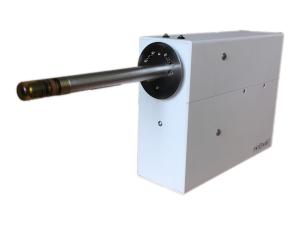 The Papillon+ Micronode© is a monoblock type assembly combining an x-ray tube and high voltage generator. The rod anode design of the x-ray tube makes it easy to deliver brachytherapy treatments to soft tissue tumours when difficult to access with other treatment devices. The Micronode© can accept a range of application-specific beam-conditioning accessories to adapt the system to different treatment requirements. These accessories are electronically identified, ensuring that the Micronode© has the prescribed accessories fitted before radiation can be produced. 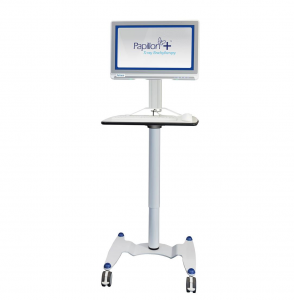 The Papillon+ is remotely controlled from a trolley or bench mounted workstation incorporating a PC computer and touch screen display. Communication between the workstation and the Papillon+ x-ray generator is via wireless links. The wireless operation facilitates location flexibility and avoids the need for hazardous cables within the treatment room. 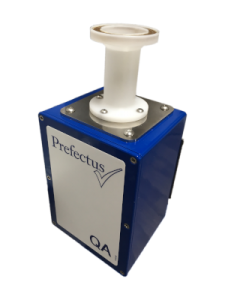 The Prefectus QA is a quality control device designed for the Papillon+™ system. The onboard system can confirm dose, energy and beam characteristics against reference measurements. As a result, the Prefectus provides a quick and convenient means of confirming output matches reference measurements prior to treatment. An optional system with radiation-on alert lights, PIR sensors and wireless door warning units. The Monitus incorporates a wireless communication module an encrypting multiplexor, which relays warning status information with the X-ray generator, Workstation and Prefectus QA control. For more Product Information on the Papillon+, its applications, beam characteristics and shielding requirements. Please contact us for the Product White Paper.